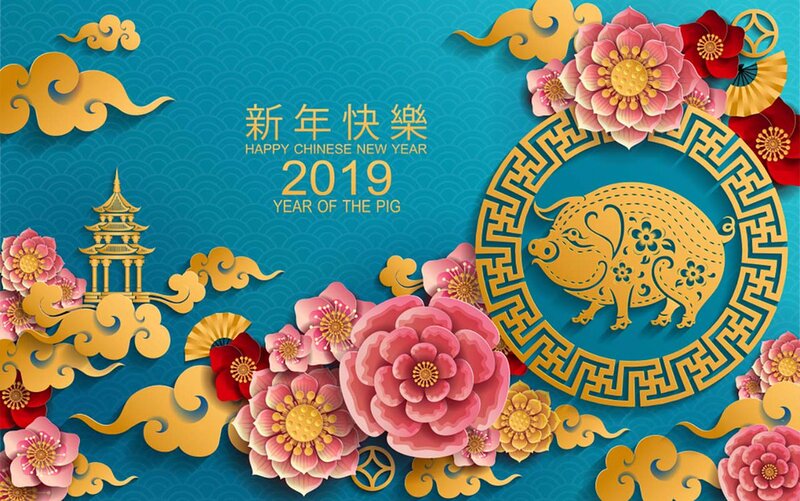 The Chinese New Year known as the "Spring Festival" is celebrated on Tuesday, February 5, 2019. Thus, the year 4,717 of the traditional Chinese calendar begins, which corresponds to the year of the Pig. • New Year's Day (February 5, 2019): first day of the first month of the lunar calendar. • Party of the Lanterns (February 19, 2019): fifteenth day of the first month. There are 15 days full of celebrations in which family visits, special meals, concerts, parades and fireworks take place. Everyone celebrates the new year, especially during the first three days of the festival. As in all Chinese festivities, they are usually accompanied by typical gastronomy. The dishes prepared for this occasion are considered as "symbols of good luck". Many cultural activities are also held during the days of the festival. Some traditional celebrations that are accompanied by firecrackers, adoration of the ancestors and dragon dances. The dragons and the parades take the center of the cities, not only of China but of the main cities of the world. Many activities related to Chinese traditions are carried out abroad. The New Year's Eve dinner, known as the reunion dinner, is the most important meal of the year. It is comparable to the Christmas dinner for Christians. A great meal is shared in which the traditional "ravioli" (shoumian), which represent longevity, can not be missed. This dinner lasts until twelve o'clock at night, when the countdown of the new year begins. The Chinese calendar is different from the one we use (Gregorian calendar). It is based on the lunar cycles while the western one is marked by the solar cycle. In antiquity, the "lunar calendar" caused serious problems to Chinese farmers, due to the difficulty of setting the seasons for the crops. • In the houses they are decorated with the "Fish" to attract abundance and, if it is also red, it also serves to scare away the "Nian" (the beast). "The Guardians" are placed on the doors to defend those who live within the presence of evil spirits. • To receive the "Spring Festival" people clean their houses with old brooms, which are then thrown away. They hang red posters with poetic verses on their doors, decorating the walls with pictures of Chinese New Year and red lanterns. • On these dates fireworks and firecrackers are launched, hoping to ward off bad luck and attract prosperity. It is an ancient and beautiful custom dating from the imperial era. • As a national holiday, most employees in China do not work for 7 days. • Children receive money from their families, and it is tradition to close the pending tasks for the New Year, so it is important to pay the debts. • In mainland China it is customary to see the New Year Gala on CCTV. An official program that features shows of traditional music, pop-rock, dances, humor, magic and the speech of the President of the People's Republic of China. We wish a happy year to the great family Chuwi and luck in the development and sale of new products and new projects started. 4-18-2019 11:12 GMT-8 , Processed in 1.618895 second(s), 27 queries .